My husband and I were proud annual pass holders at Ocean Park Hong Kong long before our daughter was born. I’ve always enjoyed the pandas, and it was a fun thing to do in Hong Kong for few hours on the weekend. Ocean Park Hong Kong is a sea-themed park that features animal exhibits, thrill rides, a playland for young kids, and a wide range of shows. A portion of ticket proceeds goes toward wildlife conservation programs in Hong Kong and Asia. We don’t live in Hong Kong anymore but return for frequent visits. We always go to Ocean Park at least once per trip. 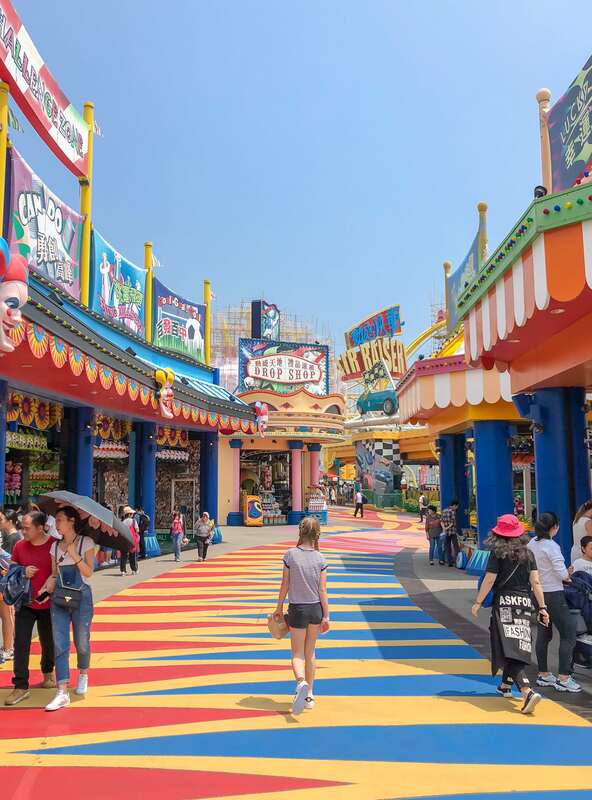 My now 11-year-old still loves it, and because it’s on the island where we usually stay, it’s a little easier to get to than Hong Kong Disneyland, can be less expensive, and is usually less hectic. This guide will help you navigate this famous Hong Kong attraction with kids and tow (and without). Discount Ocean Park Tickets with Direct Entry. Located on the south side of the island just after the Aberdeen tunnel, Ocean Park takes about 10-15 minutes to get to via taxi from Central, depending on traffic. Buses are available. For example, Citybus Route 629 leaves from the Star Ferry pier, stops at Admiralty (where several major hotels are) and heads straight to Ocean Park. The South Island MTR (train) line is now open, so this is how we get to Ocean Park Hong Kong. It starts (deep underground) at the Admiralty MTR station, quite a perk for those staying in the Pacific Place Hotels, and after one stop, you’re at Ocean Park. I highly recommend buying Ocean Park tickets (that you don’t need to redeem at a ticket booth) in advance. The park is more crowded than it used to be so the ticket booth lines can be quite long and are located in the direct morning sunlight. Plus, who wants to wait in line? If you must wait in line, get there early. One can expect a decent queue at opening. The park opens at 10:00 a.m. or 10:30 a.m. depending on the day. We arrived five minutes early on a weekday in August (when Hong Kong kids were in school), and there were enough tourists in Hong Kong to make the ticket line about a 20-minute avoidable wait in the hot sun. 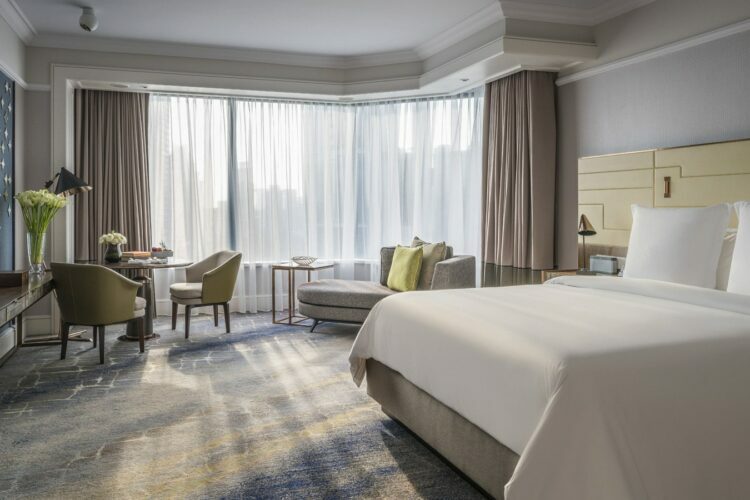 Concierges at luxury hotels near Ocean Park Hong Kong (like at Four Seasons Hotel Hong Kong) can presell tickets and bill them to your room. 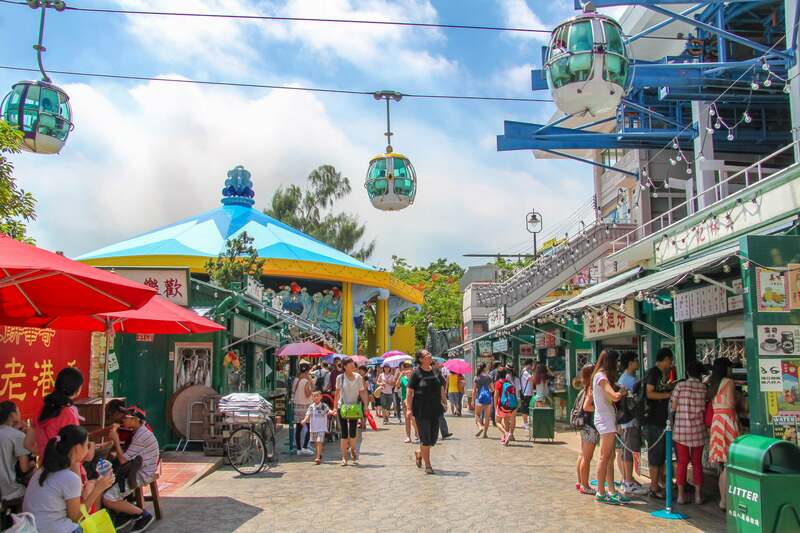 Tip: You can also buy discounted Ocean Park tickets at Klook for admission and various experiences. The neat thing about Klook is that you earn points with every purchase. Points can be redeemed for future adventures. It is a popular site to buy ticket and tours in Asia. 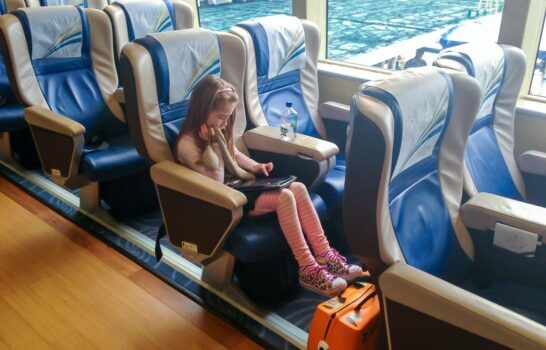 We chose to purchase the Ocean FasTrack online before arriving at the park. To pick up your Ocean FasTrack if you buy it online anyway, enter the park and go left into the gift shop. At the second counter, they’ll redeem your pass and give you a wristband to wear for the day. Currently, this is the list of Ocean FasTrack rides. Ocean FasTrack (all) which provides you with multiple FasTrack entries to the qualified rides. The price is HKD 350 and also includes priority access to the VR Mine Train. We were there midweek in March before local school holidays, and the Ocean FasTrack all saved a ton of time. The only ride my daughter loves that isn’t on it is the bumper cars. Ocean Park Hong Kong is divided into two parts: The Waterfront (near the park entrance) and The Summit (where the thrill rides and seals are). 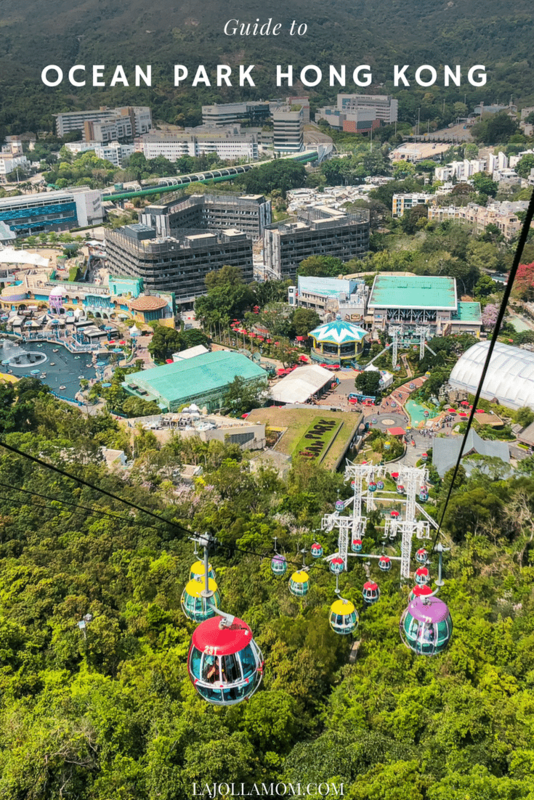 Ocean Park Cable Car: With unbeatable views, the Ocean Park Cable Car takes you up the steep mountain along the shoreline. 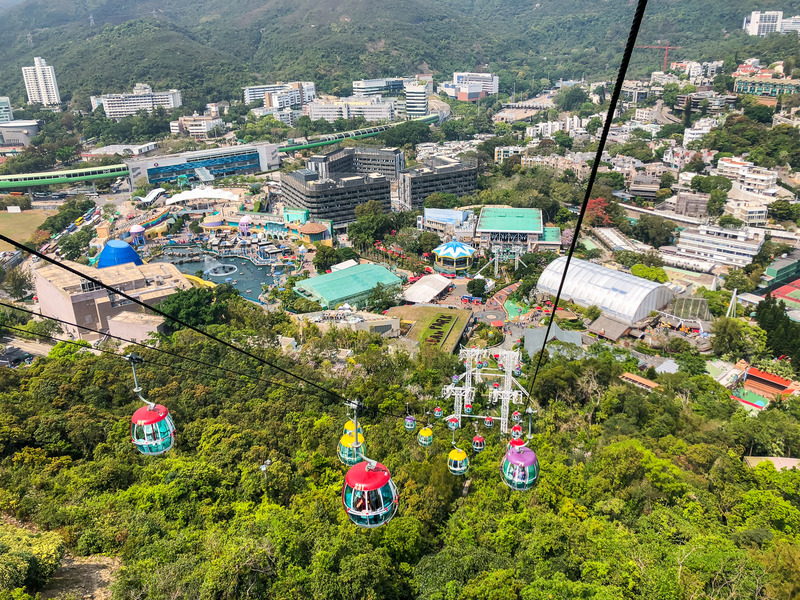 People who are afraid of heights should give this a skip as it can be a windy ride (the cars are much smaller than Ngong Ping 360 at the Big Buddha). Kids love it, and it sure is easy and peaceful. The Ocean Express: A recent and welcome addition to the park, the Ocean Express is a train that hurls guests up to The Summit through the mountain in just a few minutes. It’s air-conditioned. A little movie plays inside to make guests feel as if they are in a submarine. During peak days even in the morning shortly after park opening, the line for the cable car can be very long. The Ocean Express train line can look long, but they can fit a lot of people into each train. This is probably your best bet. Alternatively, the Cable Car line going down the mountain isn’t usually crowded until about the time the park closes. We take the Ocean Express train up and the cable car down almost every time. Now that you know there are two levels, it helps to take a look at the map to get an idea of where The Waterfront and The Summit are. You will need a map when touring The Summit as its hilly walkways and escalators can be confusing to find when mixed in with everything to do up there. There’s a lot to do and you could spend the whole day here, but here’s what we usually see. Grand Aquarium: Near the entrance, the Grand Aquarium is quite impressive. Filled with 5000 fish from 400 species, it also has the world’s largest aquarium dome to peer into. Wind your way through tunnels and various exhibits while inside. If you happen to be visiting the park in the evening, Symbio is a light-based water show set to a soundtrack that occurs in the giant lagoon outside of the aquarium. Asian Animals: Highlights here include the two pandas even though they don’t do very much activity-wise. Based on the sloped nature of the enclosure, you should be able to get a decent look. Nearby are the Asian otters (always a favorite—so cute), monkeys and some crazy-looking little alligators. Asian Animals is in between the Grand Aquarium and Whisker’s Harbour. Whisker’s Harbour: This is the play area for younger kids where there are carnival games, a small bouncy house, a sizable play structure and climbing wall, as well as age-appropriate rides. 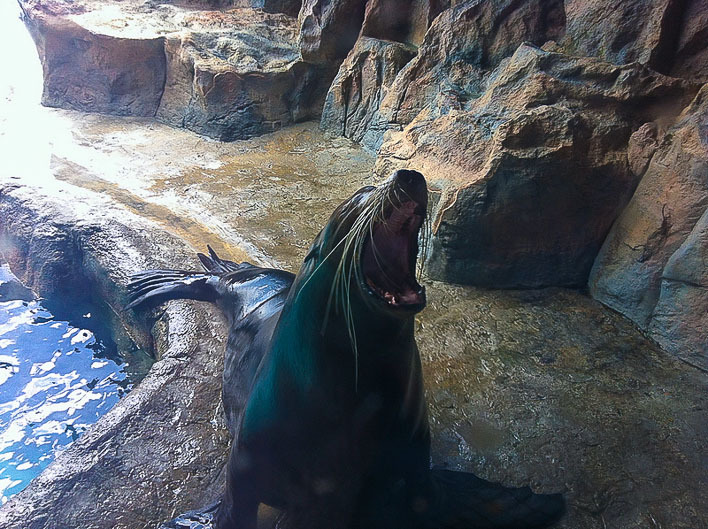 Whisker’s Theatre is an intimate little stage where there’s a great sea lion show (and others) suitable for young kids. Old Hong Kong: If you take the Cable Car down from The Summit, you’ll walk through here anyway, but it’s modeled after Hong Kong in the 1950s and something cool to look at for a minute or two. Plenty of quick local food is available, and the carousel is here, too. Thrill rides: A handful of intense roller coasters in addition to thrill rides grace The Summit, making it popular with tweens and teens. Hair Raiser is probably the most extreme (and was thankfully closed for upgrades during our last visit). Mine Train (pictured below) is now a VR roller coaster, also very cool. Carnival Games: Be prepared that the carnival games also take Octopus cards (the debit card most people use for MTR and other purchases around Hong Kong, eliminating the need to carry cash). Pacific Pier: This is where the 20 seals and sea lions are. We usually spend a lot of time here because they’re active and cute. It’s shaded here, as well. Plan your visit here around the timed feedings. Ocean Theatre: Here is where the big marine life shows are. Get there a little early for prime seating if the park is crowded. Show themes change but expect to see dolphins and possibly other sea life perform. And just because an attraction isn’t mentioned here doesn’t mean it’s not awesome. 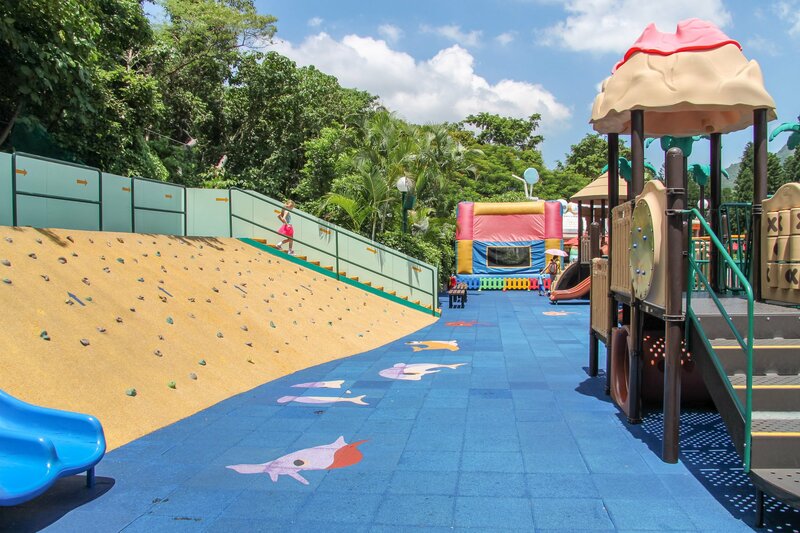 There is just a lot to do at Ocean Park. We usually stay for a half-day but a full day is possible. 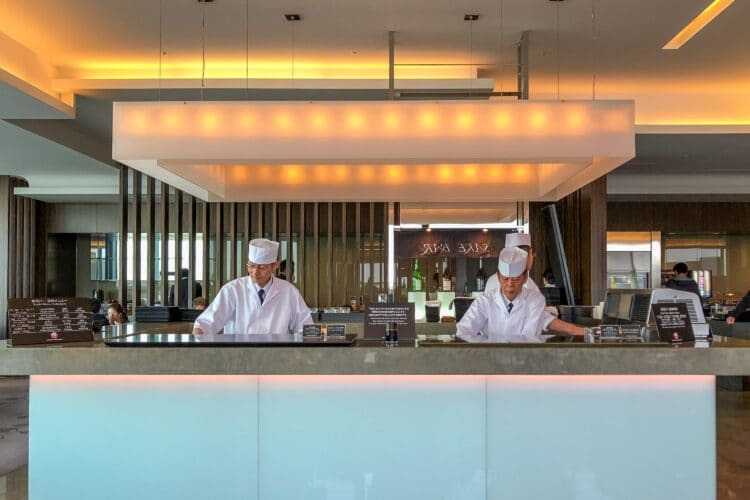 The bottom line is that you’ll likely need to eat at some point during your Ocean Park Hong Kong visit. The food is fine though it won’t knock your socks off. If visiting with kids, I would highly recommend a reservation at Tuxedos in The Summit. 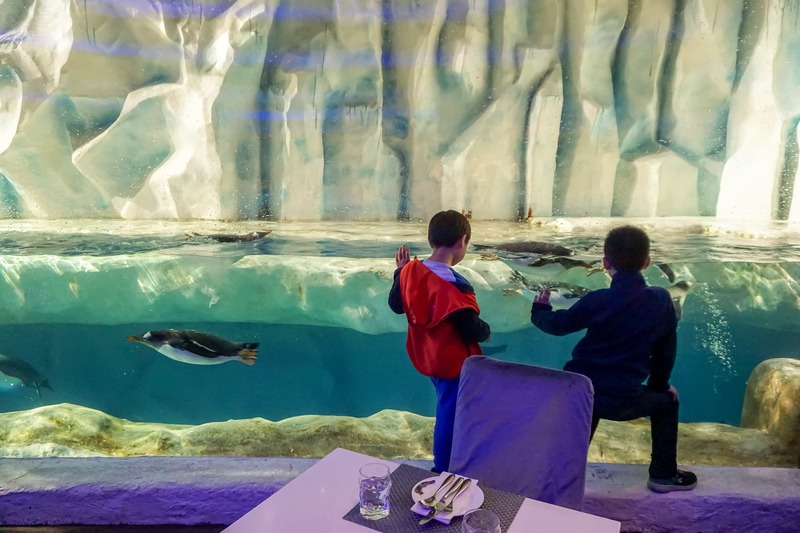 The reason is that you’ll dine with about 70 penguins swimming around in front of you. It’s adorable. It’s on one side of the penguin exhibit, so even if it’s a blazing hot Hong Kong summer, it’s cold in the restaurant. Bring layers. They’ll tell you upfront about an HKD 100 minimum per person, but you’ll hit that between food and drinks. Wine, beer, and cocktails are also on the menu. People with reservations are typically seated closer to the penguins though we’ve managed to walk in at opening during a weekday and be seated in the second row of tables. 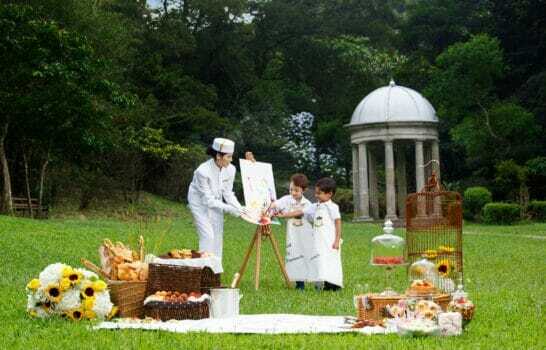 This is the only dining experience you’d need to plan your day around that I’d recommend with kids anyway. Club Panda in The Waterfront services panda-shaped dim sum (subject to availability as they run out sometimes in our experience) and other Chinese favorites. If you find yourself hungry at The Summit near Marine World, Boardwalk Cafe has good chicken rice, and the patio is shaded. If you want to eat local fare, it’s not bad around the park, especially in Old Hong Kong. Ma Chai Dessert here that it’s one of the only places you can get dragon beard candy in town anymore as it’s quite tedious to make. 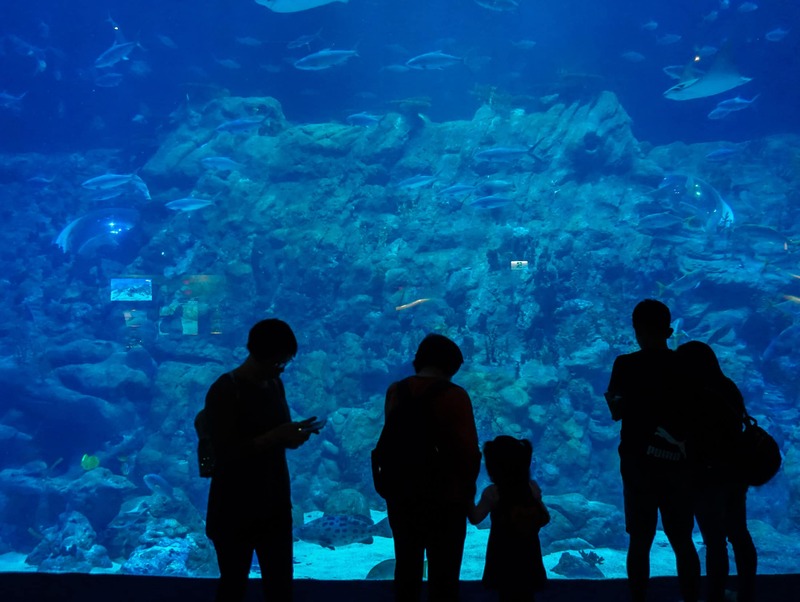 If you’re visiting Ocean Park Hong Kong when it’s hot, on a weekend or during another peak time, consider booking a special experience. My daughter and I recently experienced Ocean Park’s Honorary Panda Keeper program (my husband and I first did it together a decade ago). 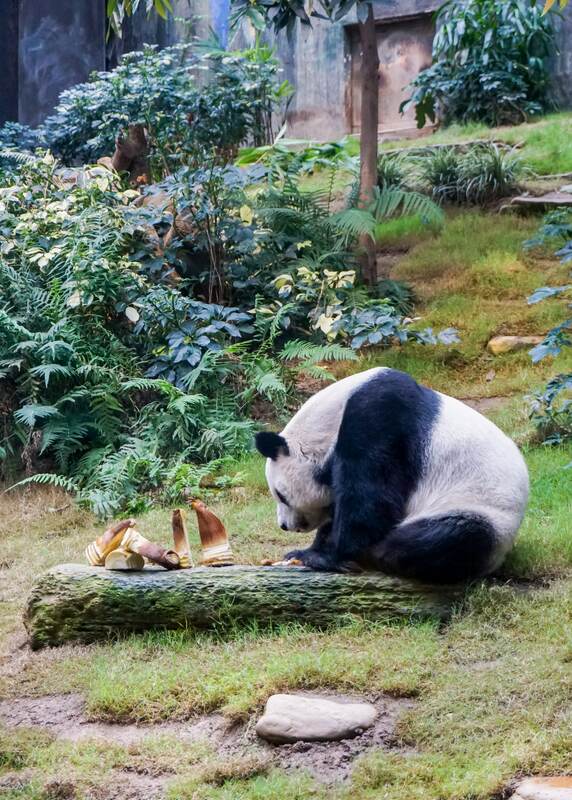 Where you go behind the scenes to learn more about the pandas in residence, make them biscuits, layout bamboo, scoop poop and see them up-close (though behind glass). Other experiences include behind the scenes tours of various exhibits, snorkel through the gigantic aquarium or even get up-close to the seals with a seal trainer. Most of the animal encounter experiences are for kids ages 8 and above. Check the website for age restrictions, current pricing, and other details. 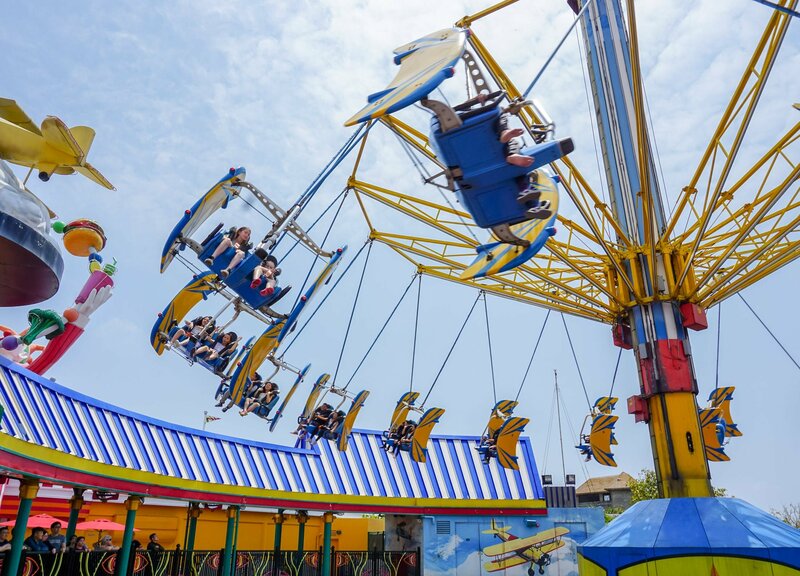 Ocean Park Hong Kong now offers a VIP tour for four hours that allows for priority parking, ride access, VIP seating for favorite shows, an up-close animal interaction, private guide and more. 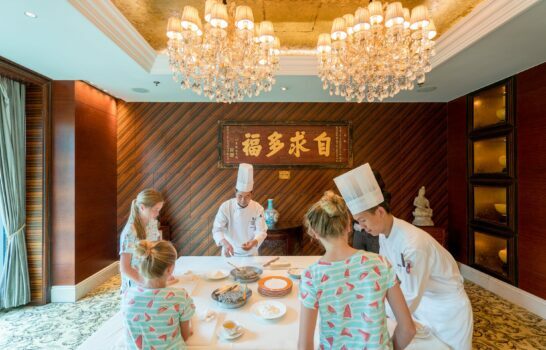 The current price is HKD 6600 for four hours and up to six guests. A recent visit to Hong Kong fell at the end of August. I thought touring Hong Kong theme parks would be okay as the local schools were in session that week. I was totally wrong. The city was so chock full of tourists from mainland China that not only was it incredibly hot, it was also crowded. Bring an umbrella for you and each child. Even if your culture isn’t the summertime umbrella-carrying type, get over it. It’s THAT hot. Ocean Park Hong Kong sells umbrellas, sunscreen as well as handheld fans that they will put batteries into for immediate use. Some of the fans even mist water (highly recommend). Bottled water and drinks are everywhere. There is some shade provided by vegetation at The Summit, but overall there isn’t much shade around the park. Be careful in Whisker’s Harbour and anywhere there is metal. The play structure isn’t shaded which means the slides and other play equipment can be hot for kids who aren’t wearing long pants, for example. Kids always seem to manage fine in the heat with a little guidance. I highly recommend downloading the new Ocean Park app as it contains show times, maps (it can be easy to get lost in The Summit area), allow you to scan QR codes to unlock coupons and provide estimated wait times for some rides. Have you been to Ocean Park Hong Kong? What are your tips? Thanks to this post we have now booked a Easter holiday in HK! Thanks La Jolla Mom! Great tips. Do they have VIP tour guides inside Ocean Park ,Hong Kong same like in Disneyland ?? we are planning to travel Hong Kong in coming July 2016 as my daughter got summer vacation want to visit Ocean park & Disneyland. Disney Hong Kong i knew that they got guides. During summer if guide available inside the park, it was better to skip the lines & finish it fast with small child as it is summer. we are used to summer anyway as we are in Dubai. But still i don’t know the intensity of hot in Hong Kong as we never visited. Not that I am aware of. They just have the VIP experiences. Hi. Is it still okay to bring kids to Ocean Park on Halloween day? Or are there too much scary stuff for them? Will there also be a lot of people there even if Halloween day is a weekday? I regret that I don’t know the answer to this. It probably will have lines though after school lets out! I use a Canon 70D and I like it so far! IS it adviseable to bring a three year old or would it be better to wait till they are much older? I had visited Ocean Park with my family on 26th July 2016. We had taken fast pass & it was very nice. Additional 150 HKD for each person for fast pass in Ocean Park. No que for us. Especially during hot weather it was really nice for us. We really enjoyed it. And Disneyland tour we had booked 3 hours tour from the official site. That was also nice. Hi I’ll be going to hongkong this weekend and i’m thinking of visiting the ocean park, I’d like to know if there’s another fee for the ride of the cable car or another fee for each activity inside the ocean park. please let me know so I can fix my budget ahead. Thanks a lot! Once you are in the park, there are no additional fees. They do have an option for a Fast Pass not that is worth looking in to. I hope you enjoyed your visit! 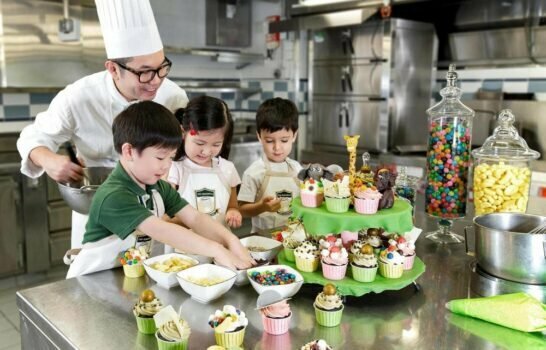 I couldn’t decide if we should take the kids to Disneyland or to Ocean Park while in Hong Kong — but after reading about your experience here, I think we’ll be heading to Ocean Park after all! Thanks for posting this!!! 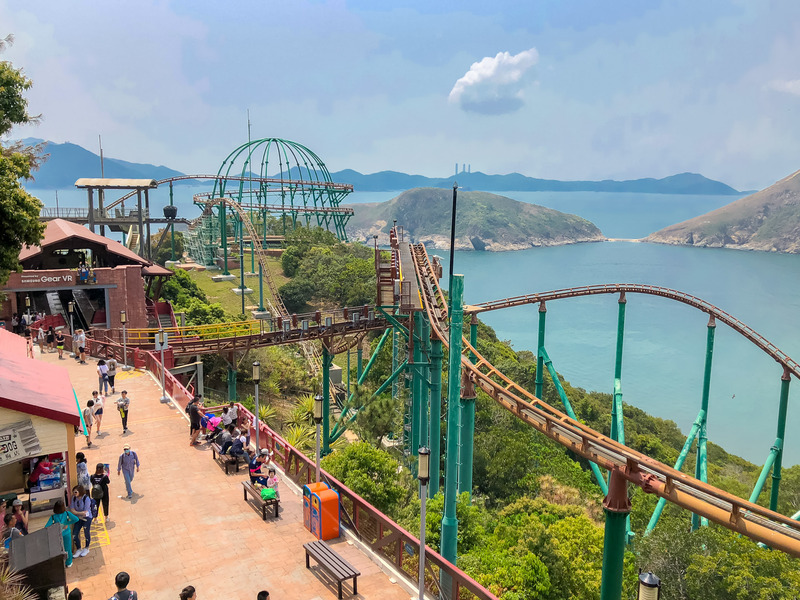 I have to update this post but you can now have a Fast Pass at Ocean Park for I think $150 HKD which would be great value if visiting during peak season. I do like it. Check the behind-the-scenes tours. Disneyland is special, too, so if you have time for both… all the better! 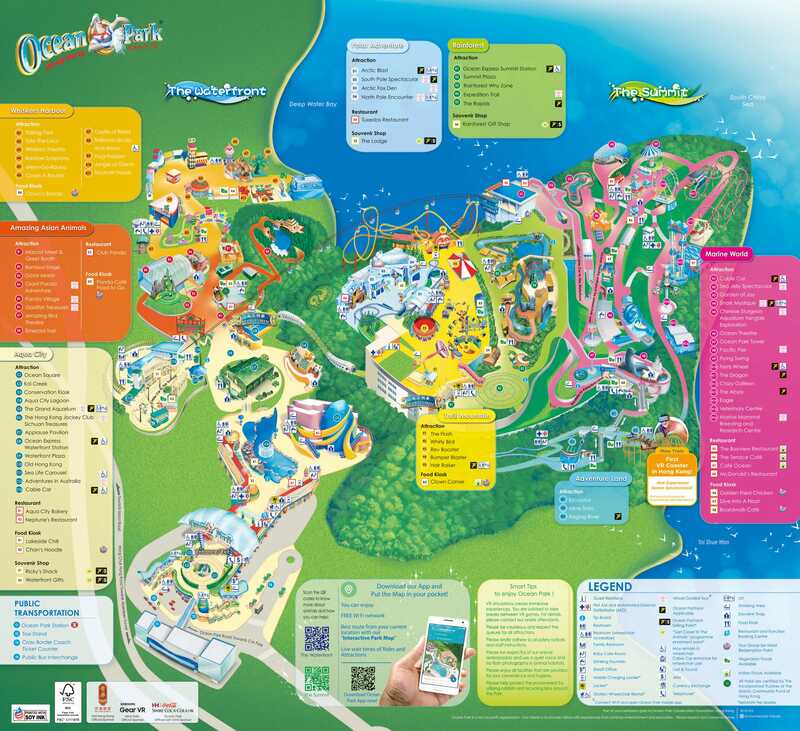 Hi, I’m planning to go HK Ocean Park somewhere in December 2016. How is the weather there, is it too cold….? Is there any water theme park in Ocean Park…? Your answer will help me to bring my winter clothing in advance. Great tips. Pretty much informative. 1. If there are any discounts for foreigners holding a foreign passport. 2. Which part or the ride in ocean park is ok to miss if we short on time? 3. How do we plan on the day at ocean park to avoid long Qs.. As i mean do we finish the rides and then check out the shows? Also as mentioned there are 2 parts of OP so which do you recommend do we do 1st? 4. We have booked hotel at TST so when is the last scheduled bus and ferry? Thank you for this! I hope we have time to go there tomorrow. OUr flight will arrive at 1030. and we hope to go there by 1. I just hope we have enough time to maximize our visit there. My family is planning on going to Ocean Park Hong Kong this Christmas, specifically on Dec. 25 to 26th (maybe 26th and 27th). Do you think the park will be crazy crowed those days? Is it a bad idea to go during Christmas? On a side note, I love your blog. I just started reading through it recently. It’s helped me plan my family’s first trip to Hong Kong a lot. Hello, Katie. Thanks for sharing this. Having read your tips, I feel like visiting Hong Kong’s Ocean Park with the full peace of mind. A special thank for mentioning such things as umbrellas and long pants for metal slides. Since we’ve planned our trip at the height of summer, it’s extremely essential. Oh good. It’s tough as it will be hot and kids may feel better in shorts. But I would bring a pair of light pants just in case that helps with the hot play equipment. Most of it is plastic but it still can be hot.